Despite his success at cultivating intimate bonds with the dangerous predators, Richardson has seen his fair share of dangers and close encounters. He notes that in his experience, a lion is most dangerous when it’s in its teen years as is big enough to kill and young enough to want to kill. A picture of a adolescent lion. Image source. 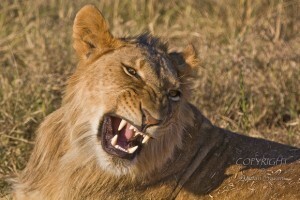 One of his encounters occurred during his first few years working with the lions. During a family celebration in the Lion Park, Richardson under pressure from his family members and still “green” enough, risks his safety by entering the enclosure of a young lion named Tsavo. Temporarily forgetting the fact that Tsavo is not one of those lions that Richardson raised from when he was a cub and that before the Lion Park, Tsavo was mistreated at another facility, he bravely ventured into the enclosure. Richardson ignored the signals that Tsavo gave him and eventually approached the lion, earning himself a massive paw to his face which momentarily caused Richardson to faint. Unfortunately for his family, they got to see Richardson being hurt and bitten by the lion but fortunately Tsavo was declawed at his first home and hence it was not a fatal injuries. Upon regaining consciousness, with the intervention of another handler, Richardson managed to escape with minor injuries. Richardson with Thor and another white lion. Image Source. 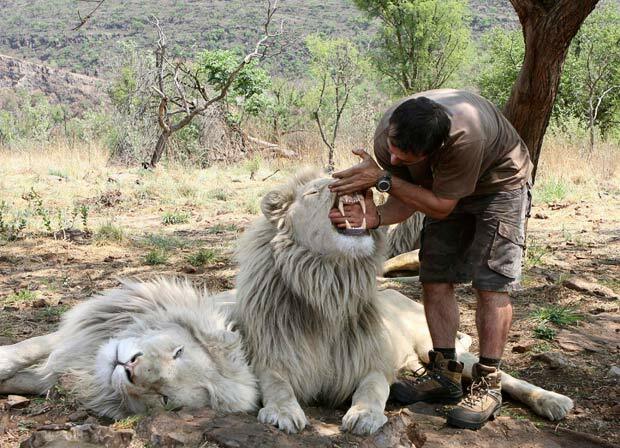 Another time, during the shooting of a film, a white lion named Thor grabbed Richardson’s arm and pinned him against the cage holding the filming crew. The crew watched helplessly as the lion held onto Richardson for about a minute before it let him go without injuring him. This was really a close call as Richardson himself, at that time thought that Thor was going to bite his hand off. However, he also stated that it was not Thor’s fault as Richardson had provoked him by forcing him to engage in a fight scene for the movie. 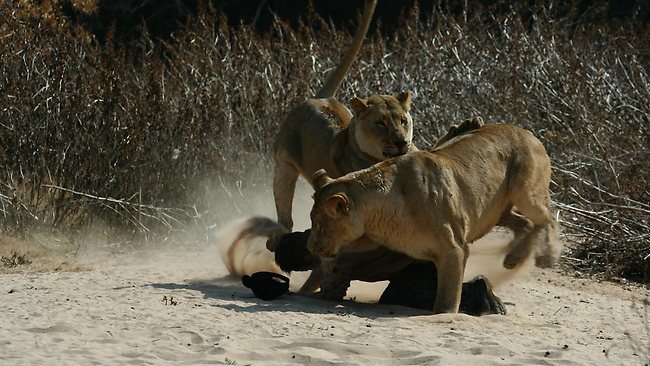 2 lionesses playing roughly with Richardson. Image Source. Richardson had also been pinned to the ground by a 4 year old lion and proceeded to bite him. Another incident occurred when two 400 pounds lions threw Richardson to the ground and a female lion jumped on him, causing him to be knocked out of breath and emerging from the enclosure, with his face red and out of breath. Richardson is always being bitten or scratched by when he plays or interacts with the big cats, but brushes all of them as being minor injuries and nothing serious. Due to all these dangers involved, some critics out rightly call him “crazy” and view his work with the lions as disastrous as it might led to other people getting ideas that they could do similar things and escape unscathed. Many people believed that his method of interactions with the predators is going to get him killed one of these days. No animal behaviourist has ever endorsed Richardson’s methods often citing the predators as being too unpredictable and cannot be trusted no matter how docile they seem.